The mater is a single plate with no raised limb. Slight, decorated throne with shackle, no swivel, and suspension ring. Outermost scale of hours, 0 to XII twice with Roman numerals, divided to 1 hour, subdivided to 4 minutes with alternate hatching. The same scale is also numbered fir degrees 90 to 0 to 90 to 0 to 90, numbered by 5. The central area of the mater is engraved with a latitude projection for 48 degrees. There are azimuths for every 5 degrees, numbered for 30 degrees either side of both the east and west points on the horizon. Almucantars for every 2 degrees, numbered by 2 to 64 degrees. Meridian line, east-west line (twice named 'Horizon Rectus', and marked 'Orient' and 'Occident'), tropics ('Tropicus Cancri', 'Tropicus Capricorni'), equator ('?quinoctialis'), lines for enequal hours beneath the horizon, numbered by 1, dines dividing the houses of heaven, numbered 1 to 12, and a crepuscular line ('Lina Aurore Siue Crepuscullin?'). The horizon line is twice marked 'Horizon Obliquus'. Rete for 41 named stars, formed from a complex pattern of tracery. The ecliptic band has the names and symbols of the signs, each with a scale of 30 degrees, divided to 10, subdivided to 5 and to 1 with alternate hatching. The back has an outer degree scale 90 to 0 to 90 to 0 to 90, divided to 5, subdivided to 30 minutes with alternate hatching, numbered by 5 degrees. For the lower half of the circle there is an unnumbered scale outside this, with 40 non-linear divisions with alternate hatching covering two quadrants: these are the divisions of the central double shadow-square produced to the edge of the plate. Zodiacal scale with names, symbols and representations of the signs, each with a 30-degree scale, divided to 5, subdivided to 1 (and using the contiguous outer degree scale to 1/2), numbered by 5. Within this is an eccentric calendar scale, with the names of the months, engraved representations of seasonal activity, and a scale of days, divided to 5, subdivided to 1 with alternate hatching, numbered by 5 as appropriate. The first point of Aries is at 21 March. The central space is occupied by a quadruple shadow square, inscribed scale of compass directions; outside the square the cardinal points are named 'Midy', Occident', 'Septentrion', 'Orient', inside the square there is 'Sud', 'Oest', 'Nort' and 'Est'. The upper half of the shadow square has scales 0 to 12 to 0 to 12 to 0, divided to 3, subdivided to 1 with alternate hatching, numbered by 3; these are repeated on the lower half, but with an additional outer scale 0 to 60 to 0 to 60 to 0, divided to 5, subdivided to 1 with alternate hatching, numbered by 5; the lower half is marked 'Vmbra Versa' / 'Vmbra Recta' / 'Vmbra Versa'. The inscribed circle is divided 1 to 32 with lines radiating from the centre, subdivided to 0.2 with alternate hatching, numbered by 1. Counterchanged alidade with pinhole and slit sights, counterchanges rule, three further rules with scales. One has a scale of declination 85 to 0 (at the equator) to 231/2, divided to 5, subdivided to 2, numbered by 5, marked 'Latitude Septentionale' and 'Latitude Meridiene'. Another, marked 'Midy' on the arm has a central disc with a scale of hours 0 to 12 twice, divided to 1, subdivided to 15 minutes, numbered by 1 hour. 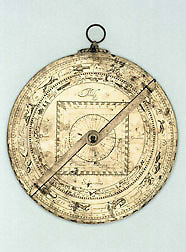 This moves above the third are having with a central disc with a similar scale of hours but numbered 1 to 24, with a linear scale on the arm, 0 to 75, divided to 10, subdivided to 5 and to 1, numbered by 10, from the position of the Tropic of Capricorn, the pivot being marked as 90; arm marked 'Meridien'. See R. T. Gunther, The Astrolabes of the World (2 vols, Oxford, 1932), vol. 2, pp. 362-4.